Maali was only 4 years old when her father, Khader Adnan, embarked on a 66-day hunger strike in protest at being held without charge or trial, a practice known as administrative detention, after his December 2011 arrest by Israeli occupation forces. All she could understand back then was that her father was starving himself to be reunited with her and her sister Bisan — and to be next to their mother when she gave birth to baby Abd al-Rahman. Adnan was released in April 2012. Three years later, at age 37, he is being held in administrative detention yet again — and has entered his second month of yet another hunger strike. Maali, now 7 years old, explains that he’s doing it to “demand his freedom and defend the rights of prisoners.” She uses words you wouldn’t normally expect from a young child, but then again “normal life” is a luxury that Maali and her five siblings have never been granted. Khader Adnan’s experience of persecution and arrests stretches back to 1999, when the then undergraduate mathematics student at Birzeit University was arrested by Israeli occupation forces on charges of affiliation with the Islamic Jihad political party. It was the first in a series of detentions — amounting to a total of more than six years in Israeli jails — during which Adnan has never been handed any formal charges or been given a trial even by the Israeli military courtswhich are notorious for failing to meet minimum international standards. Two people who have been with him on this arduous journey are his parents, Adnan Mousa and Nawal. They live in Arrabeh, near Jenin in the northern West Bank. Khader’s mother, Nawal, used to visit her son in the numerous Israeli prisons where he was held until she lost mobility and could no longer walk. In 2012, Nawal attended one of his hearings in a wheelchair, but her health has since recently deteriorated and she cannot leave her home. His father, now 78, goes from one protest to another in support of his son and other political prisoners. The elder accompanies Khader’s wife, Randa, to press conferences and vigils. 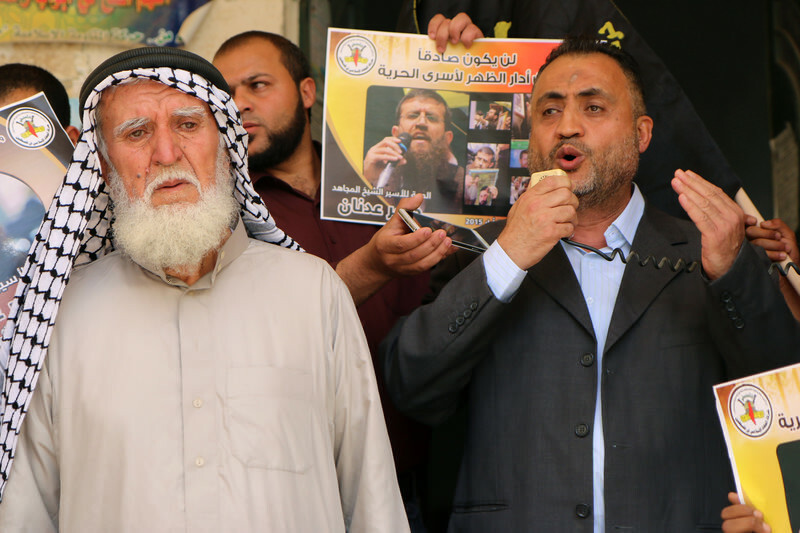 When Adnan Mousa told The Electronic Intifada that he was planning to go to Jerusalem for the protest in support of Khader Adnan, which took place on Friday, 5 June, his wife interrupted him. “But I fear they [Israeli soldiers] would hurt you,” she said. He shrugged it off, insisting that he had nothing to lose. For Randa, her husband Khader’s plight is nothing new. “He used the hunger strike as a weapon, both in Israeli prisons and in the Palestinian Authority jails where he was arrested twice and on both occasions resorted to hunger strikes,” Randa told The Electronic Intifada. Adnan’s 66-day hunger strike that began on 18 December 2011 secured his eventual release after it drew considerable popular support and international attention. It also helped highlight the issue of administrative detention — a relic of British colonial rule continued by Israel, that occupation authorities use to intimidate and grind down Palestinians by holding hundreds without charge or trial. Prisoners are usually sentenced to six months at a time, but their detention can be renewed indefinitely. Amnesty called for the “immediate and unconditional release” of prisoners held under this policy. According to Israeli human rights group B’Tselem, by the end of March, 412 Palestinian administrative detainees were being held in Israeli jails. Khader Adnan’s initial hunger strike also played a key role in sparking other individual hunger strikes by Palestinian prisoners — most notably by Hana al-Shalabi, Thaer Halahleh and Bilal Diab. They were followed by a mass hunger strike that began on 17 April 2012. Hunger striking as a tactic, however, has gradually lost efficacy to mobilize the wider Palestinian public. This is partly due to the fact that it was used by individuals when it is often most effective when implemented en masse. Its use has also varied, with most of the long-term hunger strikers going through partial hunger strikes that include only returning some meals at the start and later receiving vitamins and other nutritional supplements, but no solid food. In Adnan’s case, however, his lawyer and his family have confirmed that he is undertaking a complete hunger strike that started with only water and salt. He has since escalated the strike, refusing anything but water. Adnan’s father told The Electronic Intifada that Jawad Boulos, head of the Palestinian Prisoners’ Club’s legal unit, had visited his son on Wednesday. Boulos tried to convince him to end his hunger strike, but Adnan strongly refused, despite drastic weight loss and deterioration in his health. Currently held in solitary confinement in the Ramle prison clinic after being moved from Israel’s Hadarim prison, Adnan is also refusing treatment by any doctor employed by the Israeli prison authorities. He insists he will only accept treatment by an independent doctor. His wife Randa laments the lack of mobilization in support of Khader Adnan although it has been more than 30 days since he began the strike. Adnan’s father believes that one of the factors contributing to the relative silence is fear. Not fear of Israel, however, but of the Palestinian Authority. The Palestinian Authority were quick to embrace Khader Adnan after his release in April 2012. However, it did not take a long time for him to be marginalized — and even threatened — by the PA.
Adnan’s continuous presence in the frontline of protests, his charisma and the admiration he garnered among Palestinian youth regardless of their political affiliations made him a leader and symbol. Active and engaging, he regularly visited prisoners and the families of Palestinians killed by the occupation, usually accompanied by Randa. He visited the homes of more than 500 prisoner families and dedicated his life to the cause of the prisoners whether they were affiliated with leftist, Islamist factions or with Fatah, which dominates the PA.
“Yet during one of the prayers held after the killing of a Palestinian by Israel, he was harassed by Palestinian Authority security forces who tried to kick him out of the mosque. In another instance, he was detained for an hour by Palestinian security forces,” she explained. Adnan’s father says that not a single PA official had called him to express his support. “We received messages of support from people in Aleppo who are under shelling. We received messages of support from Homs and Yarmouk refugee camp; from Ireland where they know very well what it means to starve for freedom. But we got no word whatsoever from the PA or the ministry of prisoners,” he said. During the interview, Randa received a call from a prisoner’s mother whose son has been in Israeli occupation jails for 13 years. Such calls mean a lot to the family, as they show how overwhelmingly Adnan is admired. Randa was keen to stress how loving and gentle Adnan is. “He always helped me look after the children, changing their diapers and doing stuff that some men never consider doing. During my pregnancy with triplets, Khader was the one cleaning the house and making every effort to keep me happy and comfortable,” she said. While extremely concerned for his well-being, the family is both supportive of Adnan’s decision to go on hunger strike and confident that he will emerge victorious. Khader Adnan informed his wife and his father of his plan to go on hunger strike in case Israeli authorities were to renew his administrative detention.